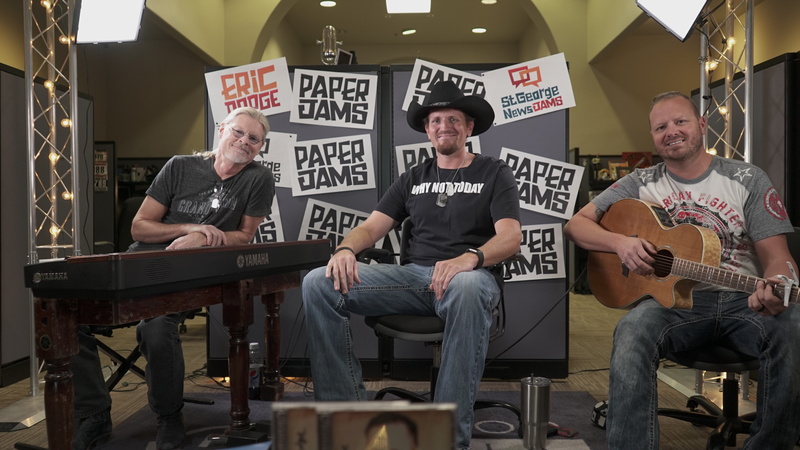 FEATURE — St. George musician Eric Dodge recently brought his own homespun brand of country to the Canyon Media offices for a St. George News “Paper Jams” session. Accompanied by his brother Andy Dodge and their bandmate John Houston, Eric Dodge performed a selection of his personal favorites during the informal half-hour performance. Check back Monday on St. George News to watch the first of two “Paper Jams” videos featuring Eric Dodge. Besides being a local favorite, Dodge has performed throughout the United States and Canada and has released several albums. He is an inducted member of the Country Music Association and the National Speakers Association and author of two books. He told St. George News he has been keeping busy lately writing and recording new songs. He recently finished filming a new video featuring the song “The Last Real Cowboy,” which was published on YouTube on Oct. 30. Dodge also is scheduled to perform a free Christmas concert at the Hurricane Fine Arts Center, 92 S. 100 West, Hurricane on Dec. 10 at 7 p.m. Dodge said he also has a special event lined up in February, in the form of the inaugural Eric Dodge “Why Not Today?” Music Cruise along the Mexican Riviera. The Feb. 2-9, 2019 trip aboard the Carnival ship Splendor is named after his popular CD and book of the same name, the latter of which takes an inside look at Dodge’s trials, fears and dreams. In the book, he shares a powerful message of how he navigated his way through a sometimes difficult life fraught with bullies, depression, weight gain and insecurities to understanding, forgiveness, strength, weight loss and hope. The cruise departs from and returns to the port of Long Beach, California. To book a spot on the cruise or for more information, call Cheri at 858-344-2735 or visit the event’s Facebook page. Friends who sign up for the cruise will be treated to a private acoustic concert, along with line dance sessions. But by “friends,” it doesn’t just mean people who know Dodge personally. He explained that he prefers the term “friends” to “fans” when referring to those who follow his music. In addition to upcoming performances and cruise, friends of Dodge may also enjoy attending “Country Cardio” live line-dancing sessions at 7:30 p.m. on the first Thursday of every month at Agrello Dance and Fitness studio, 1025 E. Tabernacle St., St. George. Cost is $10 cash at the door. Dodge said he enjoys staying connected via his social media, including occasional live streams and a blog on LinkedIn that he posts to regularly. For more about Eric Dodge and his music, visit his website. Posted in Arts & Entertainment, Local, NewsTagged cedar city, country music, Country Singer Eric Dodge, paper jams, Why Not Today?